The Trump administration announced new sanctions Monday on allies of Venezuela's Nicolas Maduro as it struggles to find new ways to boost his opponent after an effort to deliver humanitarian aid to the economically devastated nation faltered amid strong resistance from security forces loyal to the socialist leader. Vice President Mike Pence arrived in the Colombian capital for an emergency summit of regional leaders to discuss the deepening crisis and immediately met with Juan Guaido, the opposition leader the U.S. and 50 other nations recognize as Venezuela's rightful president. 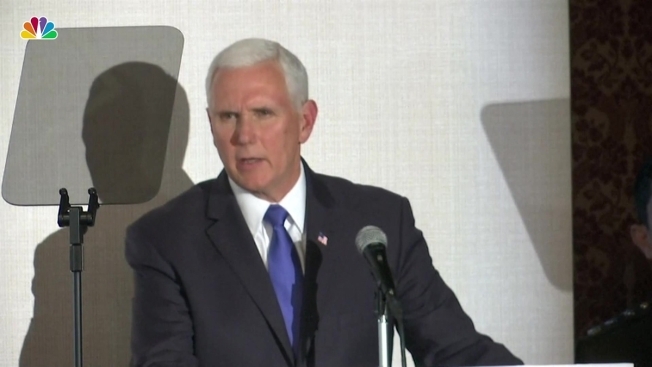 In a speech, Pence urged regional partners to freeze oil assets controlled by Maduro, transfer the proceeds to Guaido and restrict visas for Maduro's inner circle. He said the U.S. was imposing more sanctions on four pro-government governors, including a close Maduro ally who negotiated the release of an American jailed for more than two years. "It's time to do more," Pence said. "The day is coming soon when Venezuela's long nightmare will end, when Venezuela will once more be free, when her people will see a new birth of freedom, in a nation reborn to libertad." Hours later, Venezuela's government issued a statement accusing the U.S. and the Lima Group countries of conducting "a ferocious campaign to oust" Maduro by trampling on basic international human rights. The statement also rejected Pence's announcements, accusing him of attempting "to give orders so that other countries join the vulgar plundering" that Washington is pursuing against Venezuela's assets. Pence's appearance before the Lima Group comes at an important crossroads for the coalition of mostly conservative Latin American nations and Canada that has joined forces to pressure Maduro. A month after Guaido declared himself interim president at an outdoor rally, hopes that support for Maduro inside the military would quickly crumble have faded. 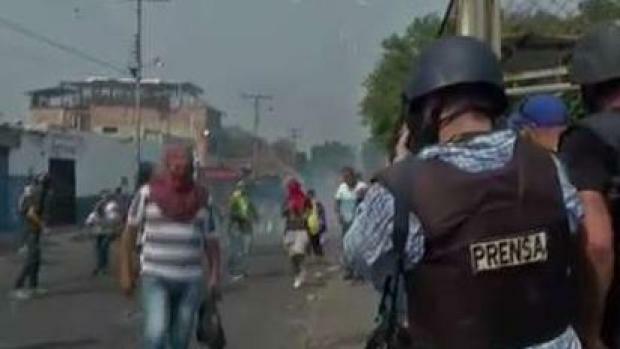 Over the weekend, security forces on the borders with Colombia and Brazil fired tear gas and buckshot on activists waving Venezuelan flags while escorting trucks with emergency medical and food kits. Four people were killed and at least 300 wounded, although only a few were hospitalized. While Colombian authorities said more than 160 soldiers deserted their posts and sought refuge across the border over the weekend, the highest-ranking among them was a National Guard major. No battalion or division commanders have come forward to challenge Maduro despite almost-daily calls by Guaido and the U.S. to do so. That's left many asking what Guaido and the U.S. can do to break the stalemate. 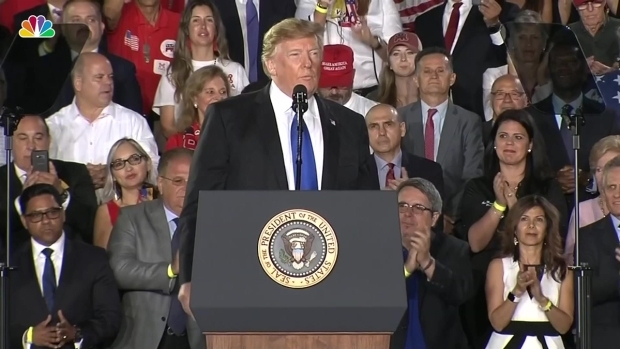 President Donald Trump addressed the political turmoil in Venezuela during a speech Monday at Florida International University. The Lima Group, in an 18-point declaration signed by 10 nations and Guaido, reiterated their call on the Venezuelan military to recognize the opposition leader as their commander in chief, urged the International Criminal Court to declare Maduro's aid blockade a crime against humanity and pressed the United Nations to play a bigger role in resolving the crisis. For now, the U.S. is showing no signs it is considering a military intervention to remove Maduro. During his visit, Pence repeated President Donald Trump's threat that "all options are on the table" but gingerly avoided talking about the potential for military action. Instead, he stuck to traditional policy tools that so far have only hardened Maduro's resolve. Foremost among them was the addition of four governors to a growing list of more than 50 Venezuelan officials under sanctions and blocked from doing business or having accounts in the U.S. The most prominent target was Rafael Lacava, the governor of central Carabobo state who played a key role negotiating the release last year of Joshua Holt, a Utah man jailed without a trial for two years on what were seen as trumped-up weapons charges. Pence also said the U.S. would continue to search for places to pre-position aid for eventual delivery to Venezuela, and announced $56 million in new assistance to countries in the region helping to absorb an exodus of more than 3 million Venezuelans who have fled hyperinflation and shortages in recent years. "In the days ahead, the United States will announce even stronger sanctions on the regime's corrupt financial networks. We will find every last dollar they have stolen and return that money to the Venezuelan people," he said. Guaido, in his visit to the Colombian capital, was afforded all the trappings of a head of state. He posed for selfies with well-wishers upon arriving for the summit and stood before a pile of aid boxes stamped with the U.S. flag as he and Pence greeted a group of Venezuelan migrants, including an elderly man who wept as he shook hands with the U.S. vice president and pleaded for help. But Guaido's speech to the diplomats was short on specifics despite speculation he would request a military intervention as close ally Julio Borges, the opposition ambassador to the Lima Group, suggested on Sunday. "Being permissive with the usurpation of power would be a threat to democracy in all of America," Guaido said. Meanwhile, the Lima Group, which has been staunchly behind Guaido, rejected the use of force. "Let's hope that the pressure of the international community, dialogue and prudence will prevail," said Panamanian President Juan Carlos Varela, who likened the crisis in Venezuela to the one his country faced in the run-up to the 1989 U.S. invasion to remove dictator Manuel Noriega. "Although the circumstances are similar, we must have the capacity to find a solution different than the one used back then." Secretary of State Mike Pompeo, in interviews on "Fox News Sunday" and CNN's "State of the Union," did not rule out U.S. military force but said "there are more sanctions to be had." Any additional sanctions will increase the suffering of the Venezuelan people and may lead to more political violence, said Mark Weisbrot, co-director of the Center for Economic and Policy Research, who advocates a negotiated end to the political crisis. "The 'humanitarian aid' this weekend was a public relations stunt, since the aid was just a tiny fraction of the food and medicine that they are depriving Venezuelans of with the sanctions," Weisbrot said. "As the Trump administration admitted, it was an attempt to get the Venezuelan military to disobey Maduro. It was a farce, and it failed." Associated Press writer Ben Fox reported in Bogota, Colombia, and AP writer Joshua Goodman reported from Caracas, Venezuela. AP writer Scott Smith in Caracas contributed to this report.